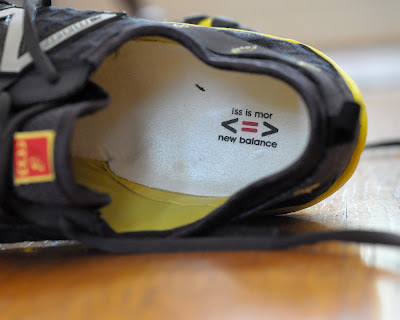 What can I write about the New Balance Minimus Trail (MT10) that you haven't already read here, here, here, or here? I mean, those are all very thorough, well-written reviews that feature many colorful photos. Surely you and the rest of the internet could do without my own rambling perspective on a shoe that's been hyped and reviewed since last Summer. 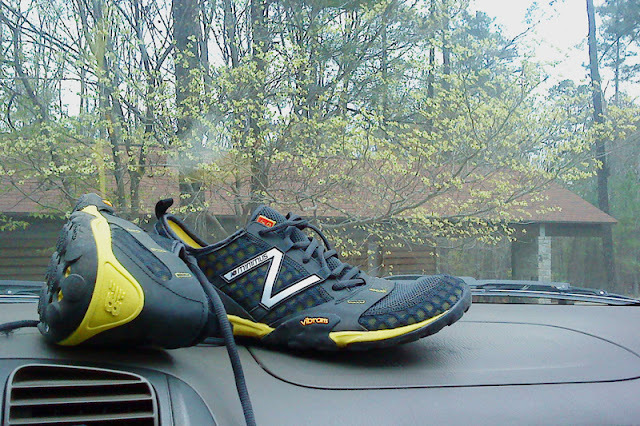 The NB Minimus Trail is pretty much awesome, especially the fit. If you like awesome shoes, then you can stop reading here. Just go to the nearest awesome shoe store and try on a pair so that you can make your final decision. Most reviewers like the way the MT10 fits and feels on their feet. Some reviewers had concerns about the band that stretches across the base of the forefoot. But, most, including this reviewer, found that the band across the forefoot became unnoticeable when running or after a short break-in period. One or two reviewers experienced defects in this banded area that caused some issues. 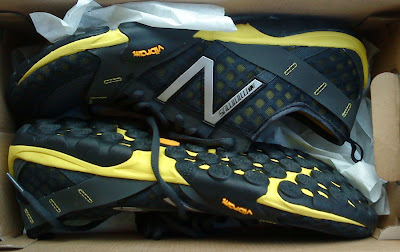 But, overall, the slipper-like fit of the NB Minimus is regarded highly. The toe box is wider than that of most shoes. The NB Minimus Trail is very flexible. You can fold it in half. The heel and forefoot specs are reported at 15 mm and 11 mm respectively, creating a heel-to-toe differential of 4 mm. This may or may not qualify as minimal to you. 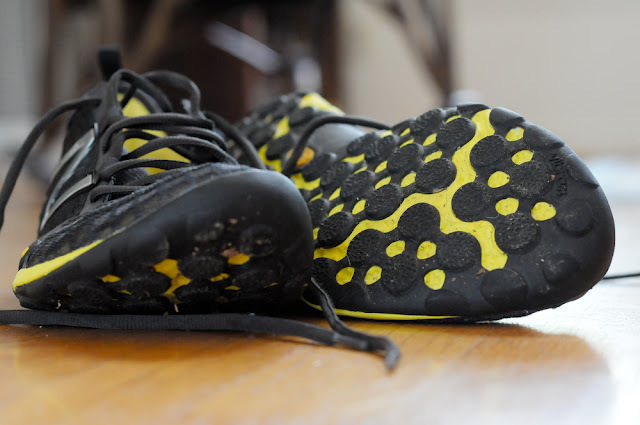 Vibram designed and/or produced the outsole, which features a web of circular lugs that grip various surfaces readily. While the outsole and midsole are stellar in construction and design, the lack of a rock plate means you're still going to feel the effects of sharp, pointy things when you step on them. So, running carelessly over rocky terrain could become unpleasant. Given the subtlety of the lugs and significant proprioceptive qualities in the midsole, the Minimus Trail allows for successful training on roads. I actually went into the shoe store to test out the Minimus Road shoe and came out with the Trail version instead. Prospective NB Minimus wearers should exercise caution if a transition to the lower heel is in order. The laces seem to be extra long, which is annoying. I usually deal with this flaw by tucking the tied shoe laces under the lacing in the forefoot area. Don't assume that the Minimus Road is just a slightly more cushioned version of the excellent Minimus Trail. It's not. They're totally different shoes. I wanted to like the Minimus Road when I tried it on in the store, because I "needed" a new shoe for road running, something with a lower heel. But, as soon as I put my feet in a pair of the Roads, I immediately felt a conspicuous bump under my arch. Other reviews indicate that this is probably meant to serve as some sort of supportive feature. Whatever it is, I hate it! That's why I ended up with the Minimus Trail. And, I'm glad I did. If you're trying to decide whether you want the NB Minimus Trail or the Merrel Trail Glove, read this comparison. But, keep in mind that there are rumors of a zero-drop Minimus Trail slated for release in the near future. Okay, that was nowhere near as brief as I'd intended. Sorry about that. Despite the gripe I have about the long laces, the Minimus Trail is definitely one of my favorite shoes. It is so comfortable and conducive to running that I wish I could wear a pair of 'em all day. Sure, it's not an all-terrain trail shoe, not in my opinion. But, with the exception of rock-laden trails (the Roclite 285s are a better tool for that), you could run almost anywhere with this shoe. As I write this post, I currently have approximately 50 miles on the pair of MT10s you see pictured. And, the majority of those miles were covered on pavement. (My maximum distance on pavement with them was around 7 miles, I think) So, the Minimus Trail really is worth consideration from anyone seeking a lightweight, minimalish training shoe. "Awesome" review Ash! ;-) I do like the MT's, but wish they came in wider sizes so I could actually get my foot into the shoe. But at least they are wider than the Merrells which were like wearing vise grips on my feet. Thanks Scott! I think that I remember reading in the comments of one of those other reviews that New Balance plans to release the Minimus Trail in widths this Fall. Don't quote me on that, though. Great review of a great shoe! I have the freaky orange ones. Have you had any issues with the pull tabs? I ripped one off of the first shoe I tried on? (bought it anyways) I too was surprised by how completely different each minimus model is from the others. It's a little harder to get them on and off, but it does allow the shoe to be tightened quick well around the arch of your foot to hold your heel in snugly while still allowing some freedom for your toes. Every single person's body and feet are different. So finding the right shoes for any person means meeting their individual needs. It is important that body type, foot shape, activity, and any problems or ailments be taken into consideration when choosing a pair. Running is great! So are the running shoes! Thanks for sharing. Too much time . . . not enough to do! © 2012 AnotherFnRunner.com. Simple theme. Powered by Blogger.